This class is the class for storing Copasi Static String Names. Definition at line 28 of file CCopasiStaticString.h. 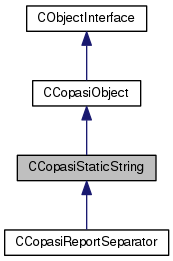 Definition at line 19 of file CCopasiStaticString.cpp. Definition at line 27 of file CCopasiStaticString.cpp. Definition at line 33 of file CCopasiStaticString.cpp. Definition at line 45 of file CCopasiStaticString.cpp. Definition at line 54 of file CCopasiStaticString.cpp. Referenced by CQReportDefinition::load(), and CCopasiXML::saveReportList(). Definition at line 35 of file CCopasiStaticString.cpp. Definition at line 42 of file CCopasiStaticString.cpp. Definition at line 32 of file CCopasiStaticString.h. Referenced by getObjectDisplayName(), getStaticString(), operator=(), and print().